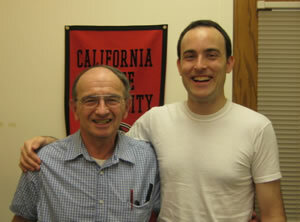 Joel and Bernard Klass, alumni. [CSUN had] the major that I wanted to pursue, which was Religious Studies. I did a minor in Jewish Studies, which I declared my junior year, and then, from my junior to senior year — mostly my senior year was Jewish Studies courses that were focused. But it was convenient, near my house. 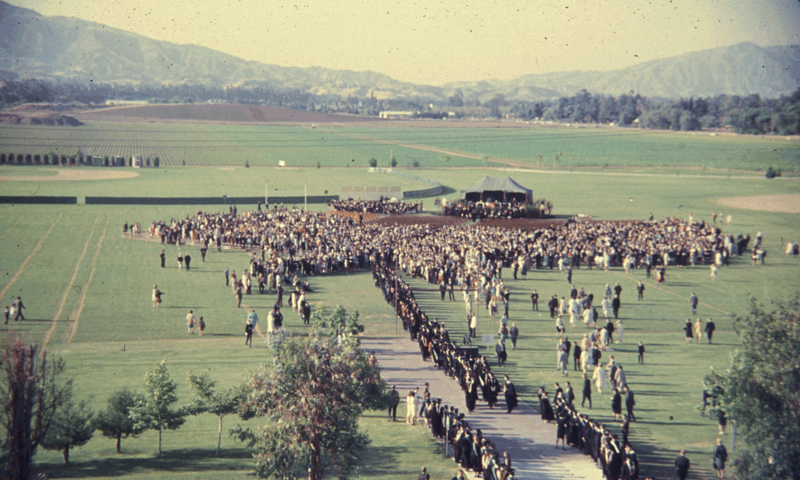 We lived in — we still live in — West Hills, and my brother went here, my father had gone here, so it’s in the family, and it was the school of choice for the major, and I had friends here and family here. I was a full-time student, and I was working. So I worked part time, and I was also a musician, so I was in a band at the time. So I was busy — I had a lot going on. With work and school there was a connection because I had work/study courses that I had to take, and I got credit for those through my job. So there was a relationship there which I was really glad that I took that course, because I really got a lot out of it. It was the “Working in the Jewish Community” course I was getting college credits for. I was working at the Jewish Federation as an office manager, and we would do different things there. We have historic bus tours of Jewish Los Angeles, there’s events, special activities. We have publications, membership. I did a lot of the website development, and all of that that I did it would culminate in a paper at the end of the semester, I would turn that into my professor as part of the final. Because of the assignments we had to do in that course, it really strengthened my bond to working in the Jewish Community. Because I had to fulfill a certain number of hours and write a paper, and the only way I could do the paper correctly is if I had done certain research in the Jewish community, and in the organization. On budget — on finances, for example — I had to research all the money that was coming in and going out, and all those things really opened up a new world for me that I didn’t really deal with before. . . . Evaluating and analyzing how [finances and political issues] affect the Jewish community in Los Angeles did have an impact on me, and changed the way I saw my job. And I think the course did open up another dimension for me. At CSUN there are at least 500-1000 Jewish students on campus– perhaps more, by now. I was involved in Hillel — they’re on every campus, and there is a social scene. They meet, for example, at the Coffee Shop — I used to go to meetings there, and we’d talk about Judaism, talk about Hebrew. . . At Freudian Sip, we would talk. . . And we would have field trips. You know, for — we’d go to the beach, or we’d go to a pool hall– it was social things, social activities. So there is a [Hillel] community, but it’s relatively small. [My experience here] really made me more appreciative, more aware, and more knowledgeable about Hebrew language, about Jewish texts, about Jewish history, history of all religions. It broadened my entire knowledge base, and that made me a different person. It definitely allowed me to mature, and to grow into someone who. . . As a result of the education I got here, I’m just more knowledgeable and more aware and appreciative of history and of Judaism. The skills I learned here have helped me greatly in my job, both at the Federation, and with teaching. . . . So it’s really impacted me as a Jewish person, I would say, the most, and that’s very valuable. I feel like I learned a lot. My situation was quite a bit different than my son’s. To give you a little different perspective on my very fine experiences here at CSUN: years ago they offered some classes in educational theory and so forth. I was already teaching [at Pierce College] at that time and . . . I met Ralph Prator at the gym. . . . Pierce, you know, their gym wasn’t air-conditioned, and they didn’t have a lot of nice facilities. I started coming up here. I saw this rather handsome elderly gentleman, and we got to talking, and I told him that I was teaching over at Pierce College. . .. So we struck up a conversation, and he said, “Well, I teach, in addition to being the president, I teach some courses in education.” And I said, “Well, you know it wouldn’t hurt to review some of the things I’m doing, maybe I can improve my effectiveness. Even though I’ve taught for many years there are always new things to learn.” I’ve kept young by trying to keep up with new things, and not just be stuck in the mud,so to speak. So I struck up quite a friendship with Dr. Prator, and I took a couple of his classes, and I found some very interesting new theories that he presented, and it helped me in teaching students.